Before listing a boat for sale, you need to create a free account. 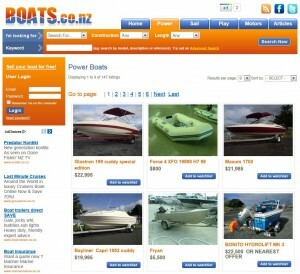 Public Users click here and Boat Dealers click here. Then come back and read the article. They say that a photo is worth a thousand words, so don’t expect to sell your boat quickly with fuzzy photos taken from too far away or just a single photo of the hull. Get shots of the boat from every angle, the interior, equipment, the motor and the trailer (if there is one). This will help potential buyers to decide if your boat is what they’re looking for, reduce time-wasting enquiries and encourage viewers to spend more time looking at your boat. Don’t try to hide anything in your photos as that just wastes your time and the buyers. Firstly, make sure that you’re taking a photo of the boat and not the water, driveway, garage or anything else that distracts from the actual boat. If a photo is framed well, it will look good online. Since the goal is to show the boat and not the scene around it, take as much of a close-up shot as possible while still fitting in the entire hull. The only exception to this is if you are standing in the boat with a huge fish. This proves it is a “lucky” boat. If you have a yacht for sale, you don’t need to show the whole mast in the shot. You can take a photo of that separately. The best light for photos is on a bright, clear morning or early afternoon. If the sun is too high in the sky, you might not be able to see some details. Take lots of photos. With digital cameras, it’s not like you’re paying for printing and you can just delete the ones that went wrong. An action shot can make a great feature photo. For more expensive boats, it could be worth paying for a professional photographer. Top quality photos can increase the amount someone considers your boat to be worth before they see it in person. When adding photos to your listing, you add one feature image and then more can be added to your gallery. Whatever you do, don’t use someone else’s boat photos without their permission. If you absolutely can’t get a photo of your boat, maybe a dealer will let you use one of theirs of the same model. You can read more about how to resize your boat photos here. Hot Tips: Writing your advert offline makes it easier to get all the details right before starting your advert. Make sure all the information is correct. Maybe get a friend to check it for you. Don’t write everything in capitals – when you’re trying to read it, it’s like being shouted at! A “feature photo”. After you’ve created your listing, you can add more photos to your gallery. A short description. Just a single sentence is fine. This appears on Google searches and beside your listing in users’ saved boats. Something like: “Great little fishing boat we’ve owned for 5 years” is just fine. Boat details. You can add as much information as you like here. Be sure to include any notes of how you’ve used the boat, how long you’ve owned it, engine specifications, details of maritime equipment included, maybe how it was stored – basically anything that someone might be interested in. A boat buyer could be looking for a specific detail you forgot to mention! If it comes with a set of lifejackets for the family, that might be what makes your boat their #1 choice! Remember how much time you spent deciding what boat to buy in the first place? Someone else is doing the same thing when they’re looking at your boat. The more information that you can provide for them, the more you’re helping them to make their mind up! Good luck!